In the book The Godfather I read that Vito Corleone became mafia because the society couldn't protect, that we have to act to protect ourselves. But somehow I didn't get it. Why did he become mafia, why a cold blooded murderer? Why does he run an illegal business? 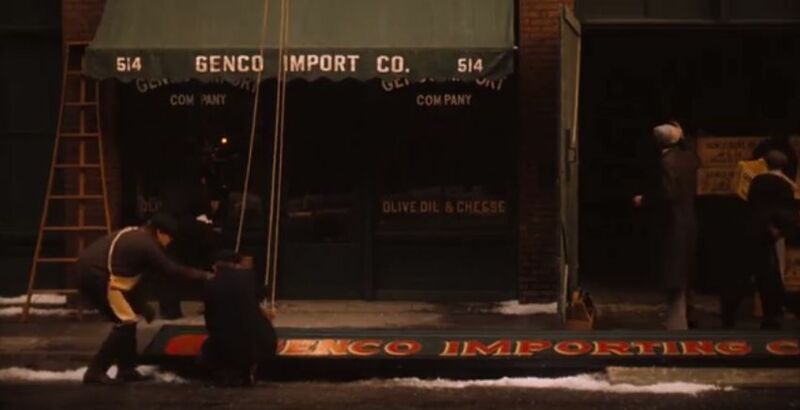 He could have been successful in a legitimate business like Genco Oil. Why? You answered your own question; "because society can't protect". You should probably take a look at the Wiki page for Vito Corleone, as it does a good job summarizing his entry into organized crime. In short, Vito is somewhat thrust into the role originally due to the actions of Don Fanucci. Vito must rid the neighborhood of Fanucci, and in doing so he becomes well-respected in his neighborhood. This leads to additional income from offering protection, which is much more than he could make by just being an oil importer. If you remember, before Vito Corleone, it was Don Fanucci who was ruling the neighbourhoud. I think when he jumped from a small burglar gang with his friends, to organized crime was when he didn't like how Fanucci exerced his power and took him out. You can see in this video how Fanucci was too heavy in extortion and was responsible of Vito being fired. This might have induced personal resentment from Vito. When he was in charge of the neighbourhood, he was more protective to the other people, hence more respected. Why did he murder Don Fanucci? I suppose when you ask "Why cold blooded murderer? ", you are talking about Don Fanucci. This question explains it well. As Don Fanucci was not liked by the people, as he was putting too much pressure on them, and Vito supposed he was not as powerful as he seemed, he took his chance to take him out. He had probably in mind that he would be more careful to his neighbours. The Company was a front for the family's criminal activities. You need to go back to Corleone. Vito family is murdered by a mafia Don because his father opposed him. He witness his mother begging the Don to spare his life and then murdered because she wanted to protect him. He then take the role of mafia Don as a protector and helper (the Signor Roberto scene). Vito had no intention of becoming Mafiosi, he saw what it did to his family in Sicily. But then Fanucci has him fired so that Fanucci's nephew could have Vito's job. With Vito out of work he comes into contact with Clemenza who introduces him to crime. Vito sees how much money can be made in relative safety from prosecution and gets deeper and deeper involved. When Fanucci demands money or he'll send the cops after Vito and his friends, Vito realizes that Fanucci is a fraud, no real Mafiosi would threaten anyone with the police, it was then that Vito decided Fanucci needed to die. After killing Fanucci the entire neighborhood changed towards Vito and began treating him as an important person. Even Clemenza and Tessio changed towards him showing both fear and respect. Only Genco treated him the same which is why Genco became consigliere. Vito became a Mafia crime lord because he had the skills and the talent for it, just as Michael did later. Why wasn't Fredo at Vito Corleone's funeral?